This project came from an idea I saw from JustOneMommy. We've always loved Yertle the Turtle (affiliate link here) so this game was a perfect fit! Children take turns rolling a die and stacking the number of turtles that they roll (i.e. if they roll a 4, they stack 4 turtles on top of each other). Children take turns rolling and stacking (in one tall stack) to see how high they can pile the turtles without them falling over. You can also do a variation of this where children just take turns placing one turtle on top of another to see how high they can pile up the turtles. We had fun doing this at home, just seeing how high we could stack the turtles before they toppled. Step 1. Make sure your egg carton is clean and dry and cut it out into separate pieces that resemble turtles. I used a giant egg tray from Costco that held 32 eggs or something like that. It was made of recyclable material that was good for painting, but a little hard to cut. Step 2. Line your eggs up on a tray or newspaper so you can paint them. This was not my favorite part. I'm not a fan of painting, believe it or not, and I realized last minute that we were out of green paint, so I had to mix some of my own! Bah! Step 3. Let your turtles dry. I am a bit of a perfectionist and I wasn't happy with the way they looked. They weren't turtley enough for me. So here's where the project got a little time consuming. I went back and added yellow spots to make them look more like turtles. But you don't have to do that if you don't want to. Step 4. If you like you can paint heads and legs/arms on them, too. I told you I'm a bit of a perfectionist so I kept adding things to the turtles, which made it very time consuming. But you can make it super simple- the kiddos won't care either way! If you opted to add heads on them, be sure to add eyes and a smile with Sharpie! Step 5. Now you're ready to play your game! Choose one turtle to be Mack (the bottom turtle). Players take turns rolling a die and stacking that many turtles. See how high you can make the stack without it falling over! Another variation is to just take turns stacking one turtle at a time to see how high you can make your turtle stack. Jersey Momma Tips and Short-Cuts! - This project took way longer than I thought it would. The Jersey Momma's Boy was too busy playing Minecraft to help paint. Sad, but true. So if you have a helper or two, the painting should go much faster. -I had a huge egg tray. You don't have to use one this big. You can use a regular dozen egg carton. Styrofoam cartons would probably work, too, but they might be harder to stack because they are so lightweight. -If your egg carton happens to be green you might not even have to paint them at all. -If I did this again I might opt to spray paint the whole tray first so I wouldn't have to paint each one individually. I don't know if it would work, but dealing with a large tray like that, it might have been faster. -These turtles don't have to be used just for Dr. Seuss Day. They would be great accents for a classroom reptile unit, or just for fun as a crafty project to make in the springtime. You can paint them all different colors, too! Rainbow turtles! -Save these turtles in a ziploc bag and you've got a game for another year! This is especially helpful in a classroom. -And don't forget to read Yertle the Turtle by Dr. Seuss so your players know the tale of Mack the Turtle and the great King Yertle!! SHORT-CUT: I haven't tried it myself, but I have seen this project done with green plastic Easter eggs. If you can find green and yellow plastic eggs, you can use them the same way as the carton turtles above. You can even draw faces and legs on them with Sharpies, too. You can find Yertle the Turtle at Amazon.com or at one of your local booksellers. Yertle the Turtle Stacking Game is a unique, crafty game you can play for Dr. Seuss Day or Read Across America Day. Let your turtles be free! My kids love this book! We will definitely be playing this in our house. Thanks for sharing. Thanks, Marie! Let me know how they like the game! Aw, thanks, Sarah! I hope your kids enjoy it. Thanks for visiting. 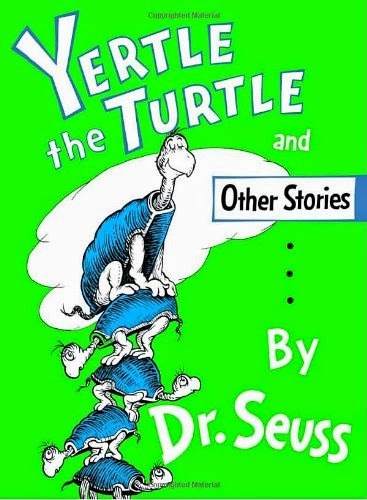 Yertle the Turtle is one of my favorite Dr. Suess characters. This activity is so fun and I love how you used recycled materials! Thanks, Shelah! Yertle is one of our favorites, too. And yes, the recycled materials are a plus! Thanks for commenting. Thanks, Kimberly! I learned my lesson about being too much of a perfectionist on this one. But it was worth it in the end! Thanks for stopping by. Clever and creative! Love it. I have never actually read this story so I guess I have to check it out. My daughter would love this activity. So cute! I love this idea. We love Dr. Seuss in this house, so we'll definitely be celebrating. This has got to be one of the few Dr. Seuss books we don't actually have! What a cute idea and a springboard for other ideas! Thank you! Yes, you can adapt it for Earth Day and birthday parties too! You are welcome! Thanks for reading it.